Halloween will be here before we know it, so start saving your milk jugs now! This kid-friendly milk jug craft is fun and easy to create and is sure to get your family in the Halloween spirit. Rinse jugs and remove labels with warm soapy water. Allow to dry completely. 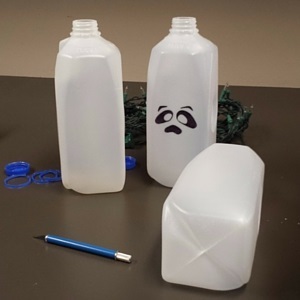 Draw a different ghost face on each of the milk jugs. Tip: Draw the faces on the side of the milk jug that is completely flat for best results. Using the craft knife, cut a small rectangle out of the bottom part of each milk jug, opposite of the ghost face. Tip: This step should be handled by an adult to avoid any injuries to children. 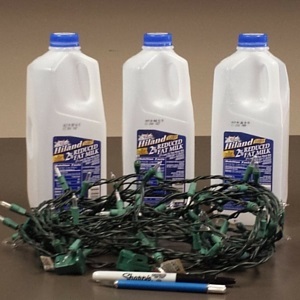 Evenly stuff the string of lights into the rectangular cut out of each milk jug. 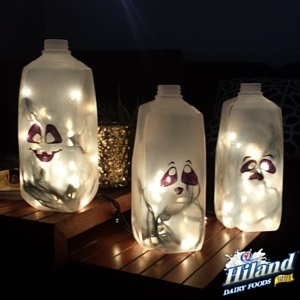 Turn down the lights in the house, plug in the string of lights and see the Milk Jug Ghost Lanterns come to life! Have other milk jug craft ideas for Halloween? 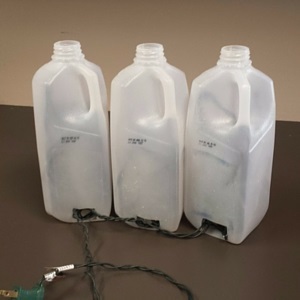 We’d love to hear how you get creative with your empty milk jugs. Leave a comment (pictures are great, too!) below with your most creative use of milk jugs for the Halloween season!